Alan has mastered numerous Grammy-winning CDs, including world-music sensation, Lagrimas Negras, nominated for Record of The Year, Album of The Year, and Best Engineered Record at the Latin Grammy Awards. Alan began his career in the '80s, doing tech and assisting at Electric Lady Studios, working with The Rolling Stones, AC/DC, Hall and Oates, and Foreigner. He then moved to a staff engineering position at A&R Recording, working with legendary producers Phil Ramone and Arif Mardin, and artists Billy Joel and Judy Collins. At A&R he recorded and mixed music scores for film directors David Mamet, Richard Attenborough, Francis Coppola, and Frank Oz, and for top-line composers Elmer Bernstein and Ralph Burns. When the studio went dark in the early '90s, Alan began working freelance, producing records for Judy Collins and continuing to record scores for feature films. He engineered and produced the soundtrack of the feature film adaptation of “The Fantasticks” for United Artists. He worked as music supervisor for Sesame Workshop, producing music and directing Muppet performers and celebrities for Sesame Street’s network television specials “Elmopalooza” and “Cinderelmo.” He garnered a Cable Ace Award for “Best Music Special,” as audio producer for “Child of Mine,” a film of on-camera live performances by Mary Chapin Carpenter, Rosanne Cash, Carole King, Emmylou Harris, and Dionne Warwick. 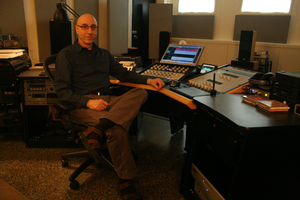 Alan turned to full-time mastering in 1996 and celebrated mastering his 60th Grammy Award project in 2015. He received critical acclaim for re-mastering the entire RCA and MCA back catalogs of British supergroup, The Kinks, in high-resolution DSD, and for an SACD featuring Norah Jones. The editors of Stereophile magazine selected his restoration and remix of the soundtrack of the Americana cult-classic documentary, “Heartworn Highways,” as one of the "Top 66 CDs of All Time." Alan still returns to recording on occasion, recently engineering the orchestral scores “Kinsey” and the Disney Company's “Casanova” . He co-produced the opening title song for the major motion picture, "And So It Goes," from director Rob Reiner. Recent mastering projects include releases by Keith Richards, Medeski Martin & Wood, Earl Klugh (Grammy Winner,) JD Souther, Ivan & Alyosha, and The Afro Latin Jazz Orchestra (Grammy Winner.) In 2014, four of the eight Grammy-nominated albums in Latin Jazz (4-NARAS, 4-LARAS) were mastered by Alan at Arf! Mastering. In 2015, he co-produced, mixed, and mastered "Strangers Again," an album by Judy Collins featuring duets with Willie Nelson, Jackson Browne, Jimmy Buffett, Michael McDonald, Don McLean, and Jeff Bridges. The album reached the Billboard top-100, putting Ms. Collins back on the charts for the first time since 1982. Reviewers have given enthusiastic thumbs up to the album's music and sound. Alan is active in the Audio Engineering Society and has chaired workshops in high-resolution mastering at the Society's national conventions. He teaches the art of mastering to undergrads in the Clive Davis Institute of Recorded Music at NYU's Tisch School of the Arts, and to graduate students in the Tonmeister program at NYU-Steinhardt.